On April 4th UCF hosted the 2013 Showcase of Undergraduate Research Excellence (SURE) event in the Pegasus Ballroom in the Student Union. Eileen Smith had eight student projects from her SVAD Converging Media course displaying at the event, and one of them was mentored by E2i Creative Designer Michael Carney. Michael’s group was working on a prototype project that supported a new research initiative at E2i Creative where we are exploring how to connect real and virtual environments with various sensors and have them dynamically drive interactions between the environments. 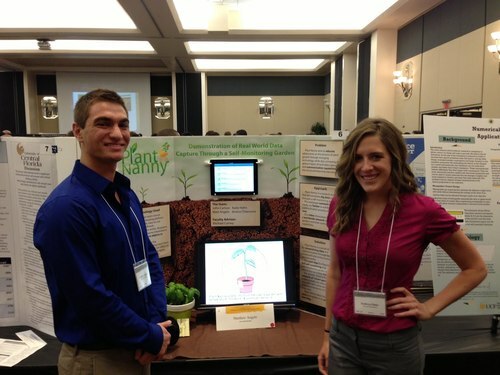 “Plant Nanny: Demonstration of a Real World Data Capture through a Self-Monitoring Garden” won the PEER award, which is voted on by the over 300 participating students representing the spectrum of UCF undergraduate research.